Following Eriza aka Lady Storm’s recent scandalous claims that the man who was her husband and supposed baby daddy was in fact not the one who sired her child, another jilted man has stepped forward claiming he once knocked boots with the sultry dancer. Lady Storm is believed to have dumped her husband for a South African based businessman whose identity still remains in the shadows. 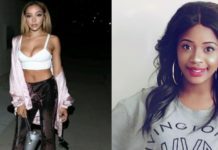 Lucky Pogolani is the latest man to claim to be a victim of Lady’s Storm shenanigans and he sensationally claims that he had unprotected sx with the dancer/singer. Lucky claims he first met the ‘heart breaker’ Lady Storm at a sports bar 2 years ago. Lucky, who also spends his time between Zimbabwe and South Africa claims people thought he was the SA based homewrecker who uprooted Lady Storm from her blissful marital life. “The dealers at Ximex mall gave me a copy of HMetro which covered Lady’s Storm scandalous tale thinking I was the man behind the whole saga” Lucky says. Lucky said it was then he decided to come clean on his connection to the dancer. The story gets interesting when Lucky claims the dancer started hitting on him and asking him to ‘hang out’. Lucky said the dancer claimed she was having problems with her then fiance identified as Mukanya. Lucky then seized his opportunity and started having unprotected sx with her as his side piece. Her fiancee got wind of the affair and told Lucky to leave his lady alone. Despite Lucky’s attempts to shut down the affair the dancer kept coming onto him and they resurrected their affair. Lady Storm apparently told Lucky that Mukanya had paid lobola for her and as a result they were supposed to call off their ‘secret’ relationship. Prior to that Lucky claims he had discussed baby names with Lady Storm and he had suggested the child be named Talia if she was a girl. To Lucky’s surprise, Lady Storm named the child Talia Chloe throwing a curve ball in the whole situation. Lucky suspects the child could he his as the dates of her birth seem to tally with the time the dancer claimed she was carrying his baby before the ‘miscarriage’. Lucky said he wouldn’t mind chipping in with the responsibilities if the child was his and he would like to go for a paternity test with Mukanya who is now claiming another third man might be the father. “I’m actually a victim in all this, she lied to me a well” Lucky claims. Lady Storm however refuted Lucky’s claims describing him as a mere fan and that Tinarwo aka Mukanya was the father of the baby. “Ndakatorwa naye picture as a fan, there are other pictures with Bev and Zoey” she said of her photos with Lucky. She refused to comment further on the issue.